Turn the key to the front of the vehicle to unlock the vehicle. 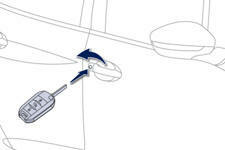 Unlocking is confirmed by rapid flashing of the direction indicators for approximately two seconds. According to version, the door mirrors unfold at the same time.